Beautiful sunny day that welcomes the walkers for the Italian 20km Individual Championship. Federico Tontodonati (ITA) goes straight to the head. He is followed a few meters by Francesco Fortunato (ITA), Andrea Agrusti (ITA), Giorgio Rubino (ITA) and Giacomo Brandi (ITA). Tontodonati maintains the advantage he had in the first quarter of a 20" in front of the group of pursuers. The turning point takes place towards the 13th km when Francesco Fortunato together with his team-mate Andrea Agrusti force the pace and goes to catch Federico Tontodonati. Immediately Fortunato, he continues at the head of the race, while Agrusti prefers to stay with Tontodonati. Does not change much. The only noteworthy variation is given by the lengthening of Andrea Agrusti that allows him to detach Federico Tontodonati. Second place to Andrea Agrusti (ITA) in 1:23:04 representing the new personal best (previous of 1:23:28 established in Bydgoszcz, POL on July 16, 2017). The women's competition is practically without history. Eleonora Dominici, we had said, was the main candidate for the victory, Italian judges allowing. This time the "green light" also came thanks to the presence of three international judges with difficulty remedied with a lot of interpersonal contacts on Friday. Dominici has made a masterful race, always in the lead, and the sad day of Gioiosa Marea can today only be a bad memory. The personal best of 1:33:32 obtained in Bydgoszcz on Jul. 16, 2017 with the fifth place at the U23 European Championships of almost 3 minutes (2:58). 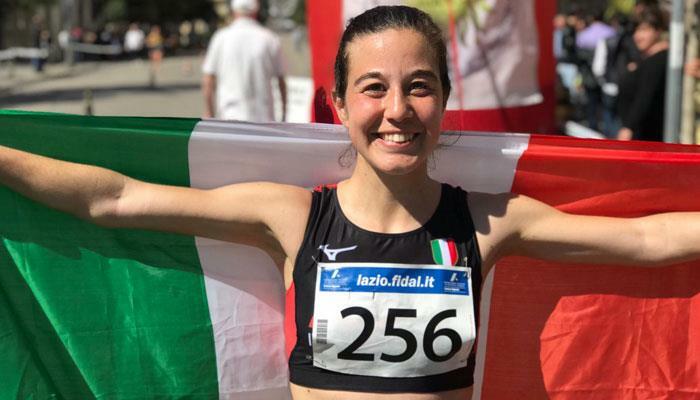 After the 10km Eleonora Dominici forces the pace and passes to 15km incredibly in 1:08:19 with a partial in the third section of 5km of 22:19 (41" less than the time recorded in the two previous 5km). This time today is the best seasonal performance in Italy in 2019 in front of Eleonora Anna Giorgi's 1:31:07 set last Sunday in Lugano, but above all it represents the fifth European performance of the season, before 1:30:55 established on March 17, 2019 from Maria Perez (ESP) to Oropesa del Mar (ESP). Before her, at the moment, only four Russian athletes who competed at the Russian Winter Championships in Sochi, but who cannot participate in international activities. Finally, and that is what matters most, obtained the entry standard to participate in the World Championships in Doha and the Olympic Games in Tokyo, thanks to the presence of the international jury that had been put in doubt until last Friday. Below is the ranking of the top ten european seasonal services updated.